Iota Localization Services - What’s the best way to set up a software localization program? 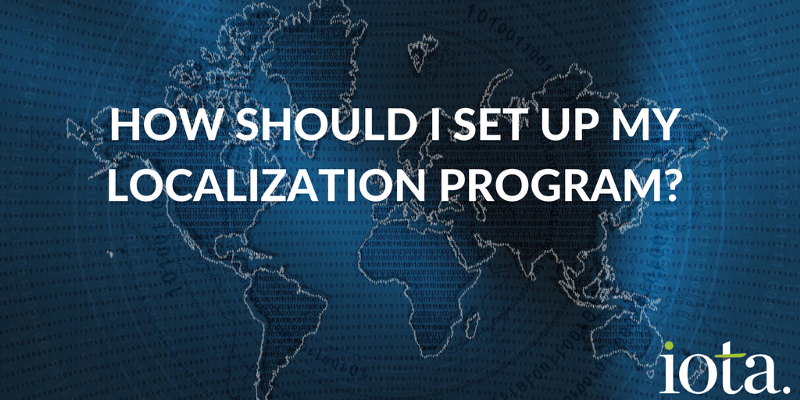 What’s the best way to set up a software localization program? Simple answer — there isn’t one. A generic ‘best way’ that is. Don’t trust anyone who tells you otherwise. The key is not to seek out ‘the best way’, and instead to look at setting up a localization program that’s most suited to yourbusiness, your objectives, and your current growth stage. I’ve spoken to a number of founders, CTOs and product owners in recent weeks who are at the stage where they have significant traction in their home market ($5+ million ARR) and are looking to specific overseas markets for the next ramp in growth. In most cases, this is driven by a specific opportunity or a notable take-up of their English-language product in a market where English isn’t the first language. When localization is on the horizon, and it’s recognized that there’s a defined business benefit in doing it, it’s time to make some difficult decisions about how to actually achieve it. Many founders and CTOs have little first-hand experience of localization and even less time to get to grips with such a complex area. It’s easy to fall into the trap of seeing it as a pure translation process. It’s true to say that text translation forms the bulk of the work, but to view a software localization project as simple translation of a few UI strings and help docs is setting yourself up for a whole heap of trouble. Engage a freelance translator to carry out the linguistic work and integrate it into the product in-house. That’s fine, but assumes a lot of things and comes with a lot of health warnings. Firstly, how do you know your translator is any good? Can they deal with terminology of your product and market? Do they have the technology at hand to make the translation process as efficient as possible, or are you going to pay extra for their inefficiency? There’s also the development time to consider — are you really going to tie your tech resources up extracting text, re-integrating it, bug-fixing etc, when they could be developing your core English-language product and responding to feature requests? Is this a good use of valuable developer time? As far as visible costs go, this is a cheap (if not easy) route to take. However, the less-visible cost of tying resources up on non-core work shouldn’t be underestimated. It also comes with the highest risks in terms of quality, delays, and final user-acceptance. Adopt a SaaS translation tool, or make use of a translation connector that integrates with your current technology stack. This is a really appealing option for many SaaS businesses. After all, SaaS businesses use SaaS solutions, right? It can be a great solution if you have localization resources in-house who can manage the nuances of the program, or trusted translators who you simply want to equip with the technology to work more efficiently and integrate more tightly with your development environment. If you don’t have these, it can simply be an additional cost overhead with few advantages. Many translation tools quickly become walled gardens that can be difficult to escape from when your needs change, and where the translations you’ve paid for are shared amongst many clients. That’s not to say SaaS translation tools don’t have a place. Just don’t let the shiny-suited salesman tell you it’s an easy and flexible way of localizing your software — in the wrong hands, it’s often not. In a hybrid environment, where you engage a trusted localization partner to integrate with your stack using a SaaS tool, it can be an excellent choice. At Iota we use a range of tools according to our customers’ preferences, and we’re always happy to recommend the best one for your circumstances. However, unless you have a mature and established internal localization team, we’d rarely recommend going it alone. Even then, there are very few global software giants who take this route exclusively. Engage a proven localization company to manage end-to-end localization for you. This is the method that is most likely to deliver the best results, without delays, and without additional internal resource requirements. But like most things worth doing, it doesn’t come cheap. A fully managed localization service represents a good investment — the initial cost will be high compared to the options above, but you’re far more likely to get a positive outcome. · Will take the time to understand your business and objectives, before building a program to meet your specific needs. They won’t force you into a way of working that disrupts your existing workflow. · Will usually be able to work directly with your source files, whatever your development environment looks like. You won’t need to tie up resources extracting text, comparing to previous versions, re-integrating, or testing beyond your usual QA processes. · Will have experienced localization engineers who will take your source files, prepare them for localization, quality check and bug-fix after localization, and return them to you in their original format ready for deployment. · Will have access to an existing network of experienced and proven translators, based in-country and familiar with your customers’ industry. · Will have tools to manage customer and industry-specific terminology effectively, and make use of translation memory to ensure you don’t pay for repetitive words and phrases to be translated from scratch time and time again. · Will have a senior team of non-shiny-suited localization experts you can turn to at any time for help and advice. To sum up, the ‘best’ way to set up your localization program will depend on your budget, experience, objectives, growth stage, and many other factors. We’re happy to talk if you’d like to explore what might be best for you — there’s no obligation and we won’t pressure you into taking a route that isn’t right for you. https://iotals.com/wp-content/uploads/2018/09/1-FDwWC4sTx_AY6Ssgm1MutA.png 400 800 Graham Rigby https://iotals.com/wp-content/uploads/2018/08/iotalogo.png Graham Rigby2017-10-16 00:00:002018-10-24 16:06:20What’s the best way to set up a software localization program?